AmwayWiki - Difference between revisions of "Sales Data"
Difference between revisions of "Sales Data"
Amway has grown fairly quickly since its inception. 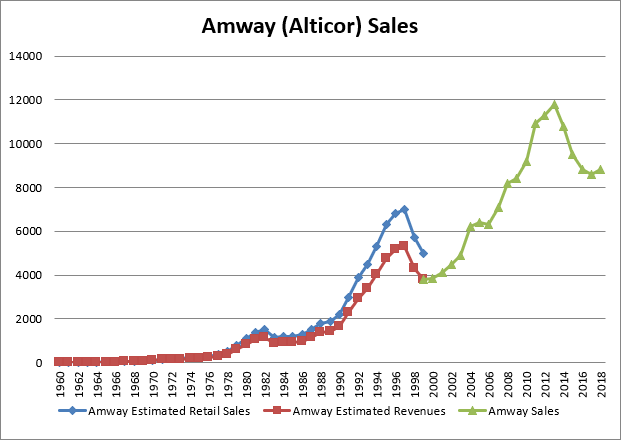 Its historic sales data at estimated retail prices is provided below from 1959 to 2000 (in 2000 Amway switch over to Alticor). At its peak in 1997 Amway estimated retail sales worldwide at 7 Billion USD. With the founding of Alticor, the report methodology was changed and the actual sales to distributors instead of estimated retail sales (ERS) have been reported since 2001. Taking the sales data published in 2001 report into account, the ERS values are about 32% higher than sales to distributors. The actual sales to distributors are marked with *. In 2000, Amway was restructed to become a part of holding company Alticor. Alticor and Quixtar sales data is reported as actual sales. Until 1999 sales were reported at Estimated Retail. This is approximately 32% higher than actual sales revenues from sales made to Amway distributors. Note: In 2006 Quixtar switched from a Sept 1-Aug 31 Financial Year to using the Jan 1-Dec 31 calendar year as the Financial Year. Both data is provided for 2005 to allow comparisons. This page was last modified on 11 February 2019, at 21:53.